I read something at Inside Climate News the other day that made me laugh and nearly cry at the same time. Anyway, the Heartland Institute held their "second 'America First' conference on U.S. energy" in August 2018, and proved — unwittingly, I hope — that the climate change crisis is being caused by an inability to imagine anything differently. Heartland co-founder Joseph Bast provoked laughter by recounting carmaker GM's response to the Trump administration proposal unveiled last week to freeze fuel economy standards. Quoting the vision statement of GM CEO Mary Barra—that the company is working toward a future of "zero crashes, zero emissions, and zero congestion"—Bast said: "That is impossible, and it's absolutely ludicrous. Zero of each of those things mean zero cars. It means zero respect for people's personal choices of transportation. It would mean a devastating impact on the economy." 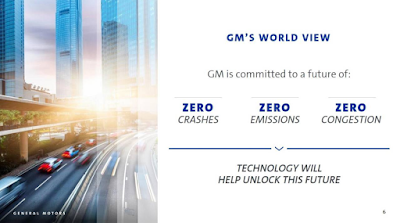 Imagine, a car company is envisioning a future of "zero crashes, zero emissions, and zero congestion" — and the Heartland Institute laughs. That would "mean zero cars," they say. So because they can't imagine a different future, a better future, a future where "people's personal choices of transportation" aren't killing off the future, they just deny the climate change crisis and focus on free-market "solutions." These free-market men in suits take themselves very seriously. But if they don't have the creativity or imagination — both signs of intelligence, gentlemen — to envision, or at least support, creative and imaginative zero-carbon solutions, then how can we take them seriously? I never thought I'd lend my support to a car company. But when it shows vision, inspiration, inventiveness, resourcefulness, ingenuity and originality; proposes some nifty ideas for fighting the climate change crisis; and uses government regulations as the parameters within which to innovate, well, I'll go with a company with that kind of imagination to make the changes necessary to safeguard the future. I think the Heartland Institute forgets that there is no economy — let alone a free-market economy — on a planet devoid of human life.